Hundreds of chalk children were drawn in memoriam to those killed in Operation Protective Edge, the Israeli invasion of the Gaza Strip. Photo by Joe Rivano Barros. 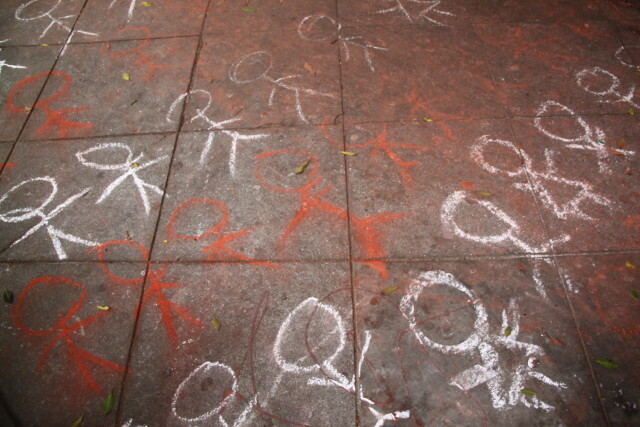 Hundreds of chalk children were drawn on the sidewalk at the 24th Street Bart on Saturday morning to protest the Israeli invasion of Gaza. Billed as memorials to Palestinian children killed in the conflict, the art went along 24th to Folsom and around the corner, and covered four city blocks with red-and-white chalk figures. The sidewalk art was apparently not coordinated with a nearby demonstration — the “Movimiento por la Reunificacion Familiar,” a march to support protection for refugee children at the U.S. border. It began at 16th Street Bart at noon at ended at 24th Street two hours later. Read more about the migrant children march here. Berta Hernandez, one of the migrant march’s organizers, said that the Mission Arts & Performance Project (MAPP) was behind the chalk art. And both demonstrations shared a spirit of solidarity — both denounced violence and supported the well-being of children. Since the beginning of Operation Protective Edge on July 8, some 1,525 Palestinians have been killed: 1,033 are civilians, including 329 children, according to the United Nations. Sixty six Israelis have been killed, including two Israeli civilians and one foreign national; 63 Israeli soldiers are among the dead. That is false and pure hyperbole. Ummmm….didn’t Hamas start raining rockets down on Israel? Or does that not count? As for all the unfortunate civilian deaths, how about the anti-Israel crowd actually acknowledging that Hamas has a large responsibility for that? Firing their rockets from densely populated areas, hiding weapons in schools (inc UN schools), homes and mosques is the root cause of the unfortunate civilian casualties. And you seem also to forget that hamas deliberately targets civilians in Israel. Ignoring all these realities is a real lapse in moral judgement. Those who are one sided (and morally blind) to this war should be ashamed of themselves. Yes, anyone attacking Israel knows that they are going to lose 100 dead for every dead Israeli. That’s been happening for 65 years. But life is cheap there and they apparently do not care. So why should we? How easily you forget that Israel created and financed Hamas to divide the Palestinian cause. Hamas is only 30 years old. Your occupation in more than 60. Your cheap “talking points” don’t fool anybody anymore. Bombing schools and hospitals? Shame on your lack of humanity. Idiot. Israel didn’t “fund” Hamas as you suggested. Funding mostly comes from great nations like Iran and quatar. (Years ago Israel did see Hamas as a counterbalance to then radical PLO.). Your attempt to warp history is ridiculous. Secondly, Israel unilaterally withdrew from gaza in 2005. Borders were open, etc. it’s after Hamas armed itself and started rocket attacks that restrictions were put in place. No one with a modicum of integrity can say that Hamas is good, or even represents, most Palestinians in gaza. But they rule with an iron fist and coerce many more moderate Palestinians. Gazas best chance to a lasting peace with Israel is without Hamas, that’s for sure.